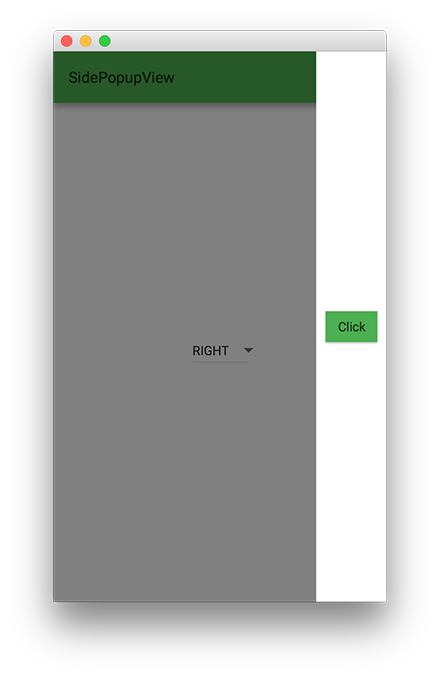 The SidePopupView class is a Layer used to show a JavaFX Node that will scroll out from the edge of the screen. By default it will appear from the left, but the other sides can be set as well. A fading animation of the background overlay will occur while the layer is being shown or hidden. The following example shows a SidePopupView when the user selects an option from the DropdownButton. The side of the screen from which the SidePopupView should appear from. Creates a new SidePopupView instance that will be displayed from the left edge of the screen, containing the given Node. Creates a new SidePopupView instance that will be displayed from the given side of the screen, containing the given Node. Override this method to add the layout logic for your layer. content - The node to show in the SidePopupView. side - The side of the screen to show the node from. Override this method to add the layout logic for your layer. Care should be taken to call this method in overriden methods for proper functioning of the Layer.